The lysis of target cells attacked by cytotoxic T cells appears to be caused by two possibly related phenomena, namely the formation of transmembrane pores in the target cell’s membrane and the cleavage and release of the target cell’s nuclear DNA. At present it is not entirely clear how these effects are mediated at a molecular level. 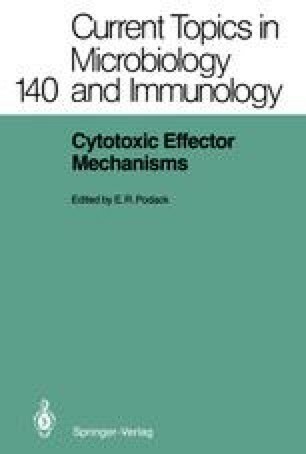 However, in the past few years, concepts have evolved and been experimentally tested that allow the formulation of a comprehensive hypothesis to explain the main steps of lymphocyte-mediated cytolysis (Podack 1985; Henkart 1985). This said, it should be pointed out, however, that at the time of writing none of the effector molecules discussed below can be unequivocally linked to the cytolytic process, when intact killer cells lyse a target cell.